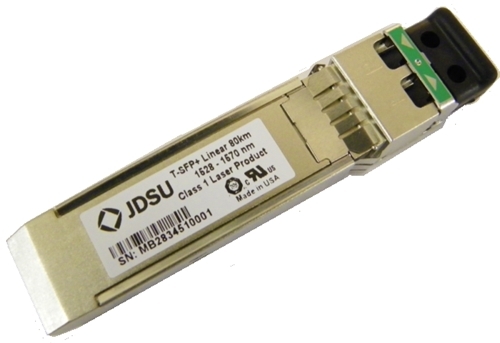 Milpitas,Calif., August 16, 2011 –JDSU (NASDAQ: JDSU and TSX: JDU) today announced that is has developed the first tunable SFP+ transceiver to replace fixed wavelength SFP+ transceivers and legacy products in Enterprise and Metro networks. JDSU created the new transceiver leveraging its Integrated Laser Mach Zehnder (ILMZ) chip that was developed in 2007 and used to create the world’s first tunable XFP transceiver for telecom networks in 2009. The tunable SFP+ transceiver will act as the ‘on and off ramp’ for optical networks, converting between electrical and optical data streams as data enters and leaves a network. Different colors (wavelengths) of light are employed totransport information optically and the tunable SFP+ transceiver will allow network operators to flexibly switch from one wavelength to another to optimize the performance of a network. Along with flexibility of wavelength provisioning, the tunable SFP+ transceiver will ease the cost of holding expensive inventory required with current fixed wavelength SFP+ products. The new tunable SFP+ transceiver also represents the first time that full C-band wavelength tunability has been successfully demonstrated in such a compact and low-power SFP+ platform. JDSU is currently demonstrating the tunable SFP+ transceiver to customers and expects it to be inproduction within the next twelve months. • Flexible network management. A tunable SFP+ transceiver will be remotely configured fora specific wavelength to support bandwidth changes as needed in Enterprise or Metro networks. • Reduced network inventory. One tunable SFP+ transceiver will support more than 80 different wavelengths. It will allow network operators to hold one tunable device code as opposed to 80+ fixed wavelength transceivers. • Reduced power consumption. It will provide a significant reduction in electrical power dissipation compared to other tunable solutions. • Compact and high-density form factor. The new tunable SFP+ transceiver will be aboutthe size of a pack of gum, saving valuable real estate in data centers. • Increased network capacity. The tunable SFP+ will double the number of channels supported in this compact transceiver form factor. Upgrading to 50GHz channel spacing doubles the capacity potential in Enterprise and Metro networks. The tunable SFP+ will also replace larger and less efficient legacy products such as the X2 and XenPack transceivers. Enterprise networks support large businesses, governments, hospitals and campuses providing critical communications and data back-up services, as well as providing a gateway to the wider metro network. Applications such as cloud computing, voice over IP (VOIP), email, video conferencing and other internet applications critical to operations are driving large amounts of bandwid ththrough these types of networks. Metro networks are located in cities and larger neighborhoods and support the transport of network traffic throughout the metropolitan area. The popularity of on demand applications such as online video is increasing traffic throughout metro networks as consumers access applications at home or at local venues via devices such as electronic tablets and smart phones.